Dedicated head and sill to accept awning sashes with manual chain winders with Standard 30mm or alternative 44mm nailing fin jambs. We also have a double glazed. 44mm nailing fin frame for those projects with double glazed fixed lights. Complies with AS2047, with a high water resistance of 450Pa. With a very low air infiltration that makes this product suitable for air-conditioned buildings. Besides the standard manual chain winders the awning sashes can be fitted with concealed electric chain winders or cam handles. Flyscreens can be fitted behind awning sashes with winders. Wrap around light sashes will accept glass up to 6.76mm thick, we also have wrap around sashes that will accept 20mm IGU’s. 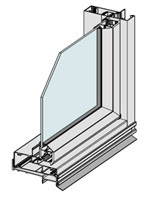 The heavy duty beaded sash will accept glass from 4mm to 20mm thick. Fixed lowlights can be glazed from the inside in elevated situations by reversing the removable glazing beads. Fixed lights can be single or double glazed with glass with glass up to 24mm thick.